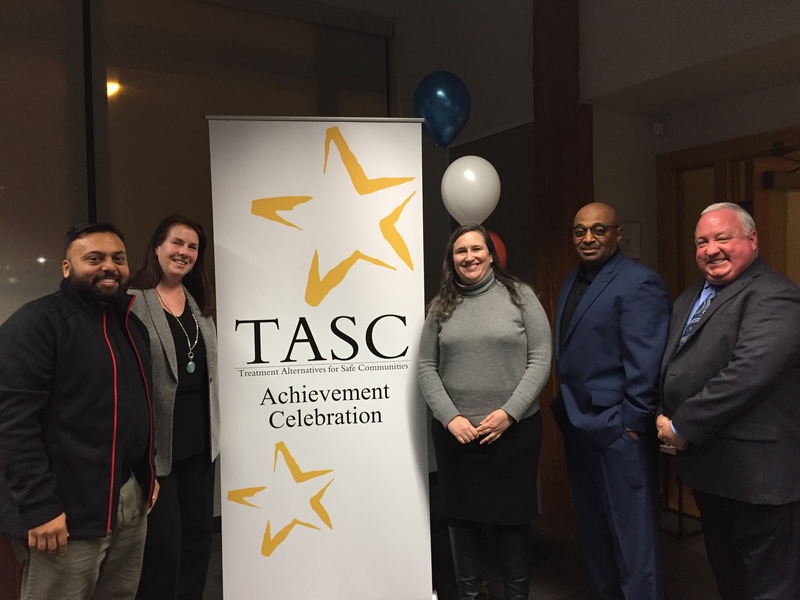 (Chicago) – Youth who have completed services offered through the Lurie Children’s Juvenile Justice Collaborative (JJC) were lauded by parents and program partners at the JJC’s inaugural achievement celebration at TASC on November 16. Launched in 2017 by the Ann & Robert H. Lurie Children’s Hospital of Chicago, the JJC is a partnership between Lurie Children’s Strengthening Chicago’s Youth (SCY), the Cook County Juvenile Probation and Court Services Department, Treatment Alternatives for Safe Communities (TASC), Illinois Collaboration on Youth (ICOY), and ten community-based service providers. The JJC helps young people steer their lives in a positive direction after they have been arrested for offenses such as getting in a fight at school, possessing drugs, or partaking in a theft. Through this multi-agency initiative, youth aged 12 to 18 have the opportunity to participate in comprehensive programs and services rather than be detained in the juvenile justice system. Through engagement in these programs, they learn skills such as managing emotions, developing healthy relationships, and discovering new skills and activities. Individuals are referred to the program by probation officers, and TASC care coordinators work with youth and their families to determine which services will be best for them, partnering with a network of organizations to offer free, individualized services and care. A comprehensive array of partners has collaborated to support youth in their success. Along with the convening partners, JJC’s network of service providers includes Aunt Martha’s Youth Service Center, BUILD, Inc., Heartland Human Care Services, Lawrence Hall, Maryville Academy, New Life Centers of Chicagoland, SGA Youth & Family Services, UCAN, Youth Guidance, and Youth Outreach Services. Celebrating achievements of Juvenile Justice Collaborative (JJC) participants (l. to r.): Avik Das, Cook County Juvenile Probation and Court Services Department; Alicia Osborne, TASC; Rebecca Levin, Strengthening Chicago’s Youth (SCY), Ann & Robert H. Lurie Children’s Hospital of Chicago; Anthony Harden, TASC; Bill Pieroth, Cook County Juvenile Probation and Court Services Department.